Lately I have just been overwhelmed by all sorts of annoying distractions and nonsense, so my stitching progress has been slow. 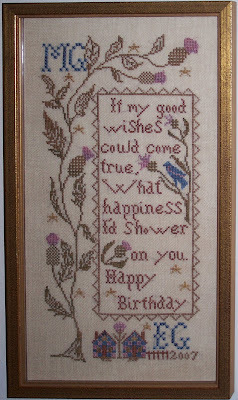 I did however, manage to get a picture of "Happy Birthday" framed. I actually finished this last year. I did it for my mother-in-law who celebrated her eightieth birthday last July. The design is by Blackbird Designs. 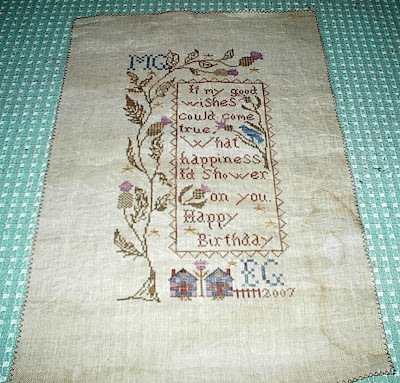 I used Sampler Threads from the Gentle Arts and stitched it on 32 ct hand-dyed linen. Originally, I did not plan to frame it because my mother-in-law has said many times that she did not have any more wall space to hang anything. I decided to turn it into a scroll to be presented and untied. I searched for quite a while until I found a piece of calico that exactly matched the color of the thistles. I finished it with the calico folded over the front to show the color, and made ties that wrapped it in a bow. I only wish I had a picture of that. I thought I had taken one, but I cannot seem to find it. Anyway, when I gave it to her, she decided she would rather have it in a frame. Here is a picture of it framed. I like the way it turned out! I think the frame is just right for it! What a stunning piece for a special birthday memento - it looks beautiful framed. That came out just beautiful! In the Forest is Finished!